The morning run of both NOAA’s global forecast model (GFS) and the European agency’s (ECMWF) is in. Both continue to indicate an area of low pressure developing early next week in the mid-Mississippi Valley. We start our journey with the ECMWF (the Euro). Generally, this is my preferred computer model for forecasting, especially beyond 48 hours. The Euro develops an area of low pressure initially over Oklahoma and Texas Monday afternoon. The low then moves east. Below is look at the Euro’s projection of Mean Surface Level Pressure and precipitation at 6am CT Tuesday, December 18. 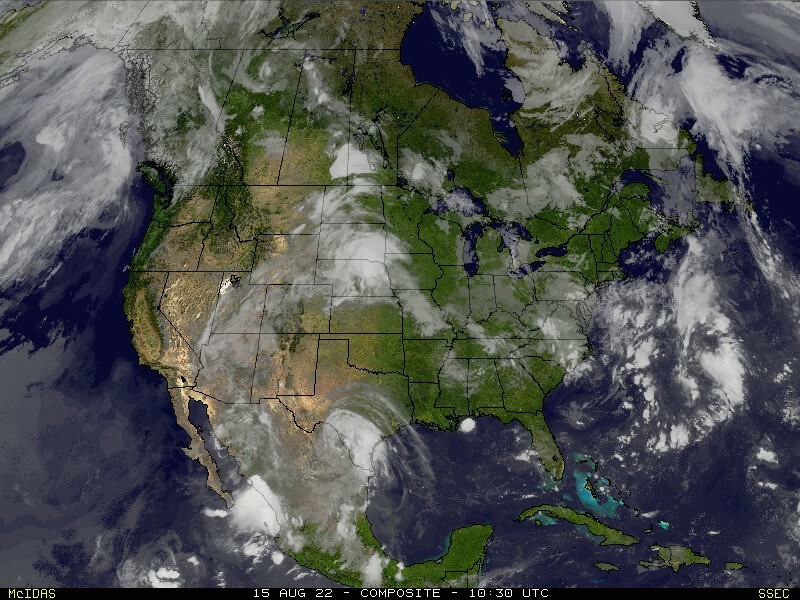 You can see the area of low pressure centered over NW Mississippi. That is a perfect location for measurable snow in parts of southeast Missouri, western Kentucky and extreme southern Illinois. The big thing to note, look at the lack of moisture. The storm doesn’t draw up a lot of moisture. I also want you to note the grey and blue area in SW Missouri. This is likely generated by the upper-level low coming in on the NW side of the storm. Upper-level lows can and often do produce snow. Usually it isn’t the BIG amounts of snow you see in snow storms, but more of a drier/fluffier snow. The next image is from 12pm CT Tuesday. The upper-level low is located over SW Missouri/NW Arkansas. 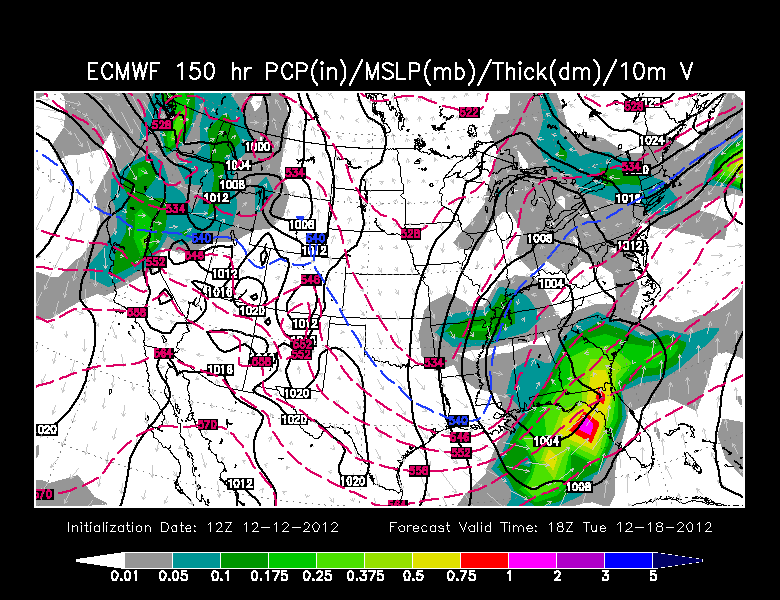 Notice the moisture the model tries to develop on the NW side of the surface low over the “Heartland”. Just a quick view of the model would suggest 1”-3” of snow in parts of southeast Missouri, extreme southern Illinois, western Kentucky and northwest Tennessee. 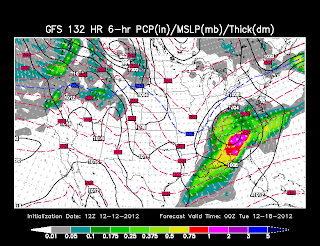 The GFS on the other hand is a little quicker with moving the storm through the Midwest. It is also much drier. 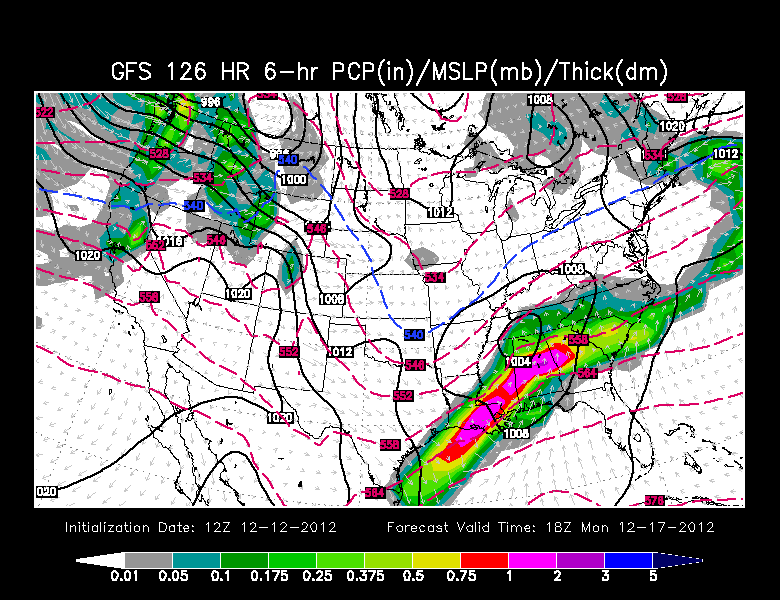 Below is the GFS for 12pm CT Monday. Note it has the area of low pressure over NW Alabama and SW Tennessee. The location is good but look on the north/northwest side of the storm. It is dry. 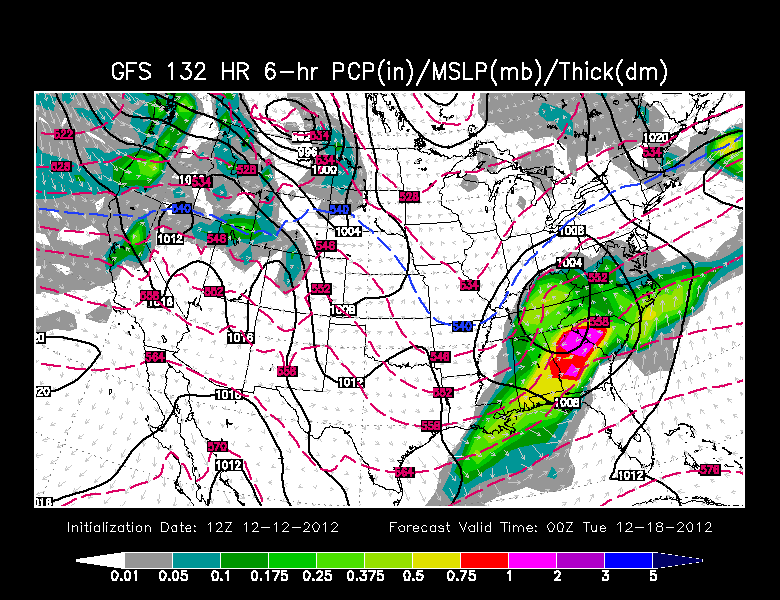 Also notice that we are talking about the storms location 24-36 hours earlier than the Euro. Here is the GFS for 6pm CT Monday. It is quickly moving east to the coast. 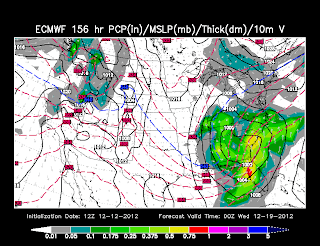 In fact, beyond 6pm CT Monday, it develops are large storm for the east coast. At this point it is entirely too early to be talking about specific snowfall amounts. Heck, at this point it is too early to know if this storm will develop for sure. As I mentioned in my earlier post from today, I want to see the models continue to show the storm on Thursday and Friday’s runs before I get too excited. I am keeping my “Freak-Out-Meter” at 0.5 out of 10.